OK, bear with me. We all know the importance of content. If you have a website, no matter if you’re an online business owner or a blogger, or whatever… you need content. Content is king, remember? The easiest, and often the best way of getting your hands on some fresh content is writing it yourself. Writing, however, can be a difficult task at some times. Especially when you simply run a word processor and try to put some initial words on the screen. Finally, what do you think about this whole idea? 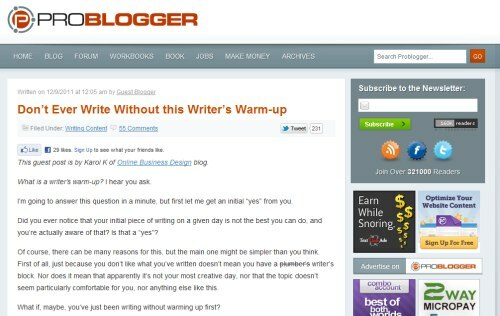 Is warming up worth the effort? For me, it’s one of the most important steps towards crafting a decent post. Writer’s Block – Kill the SOB in Just 3 Steps!